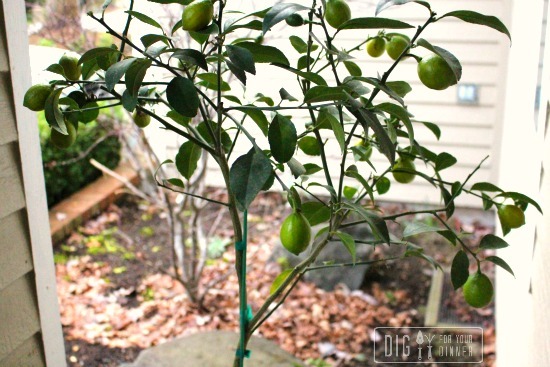 Last fall when the temperatures started to drop, I moved Lemon, our Meyer lemon tree to our covered front porch. I water her once a week and empty the coffee grounds from the HH’s french press around the base of her once a month. That’s it. No fancy citrus fertilizers, no fancy fabric coverings, nada. And guess what? Her fruit is starting to turn YELLOW. P.S. 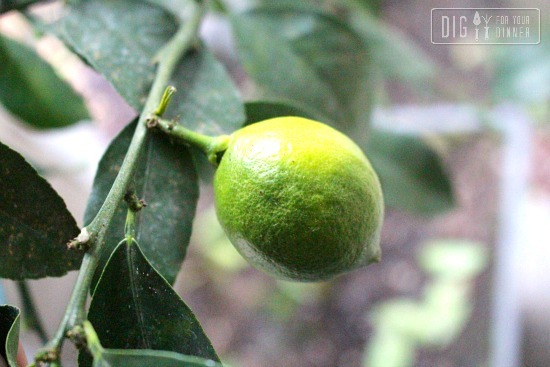 Are you growing citrus in your neck of the woods? Do you have any secret growing tips you want to share? Lettuce, Tomatoes, Squash... We're Growing it All! I haven’t but now I am thinking I should. I’m in the Carolinas, but my family is from the gulf coast, and I have childhood memories of my great aunt’s kumquats. I like the idea of growing the citrus that is pricier in the grocery store. Have a great Sunday! When I saw “Oh, Lemon!” I got worried that Lemon was not doing well. I think I need to get myself a lemon tree. I live in Alabama but it gets cold enough here that I’d need to bring it inside I believe. Go for it Kathy… you’ll never know unless you try. I am super excited about Lemon! I do fertilize. The coffee grounds are great nitrogen and lemons are heavy feeders, but I also use a more acidic fertilizer (very diluted), too. I also mist every 3 or 4 days. Works a treat. In central Texas (Zone 8b) and I have an orange and lemon tree. I spent time in southern New Zealand and realized that you can grow lemons in colder temps if you planted next to house. The guy told me that the warmth of the house keeps the tree from freezing, but to cover with a sheet the part that is further away from house. The orange tree was my son’s idea. He wanted to plant every seed he came across. Now 3 years later I have a 4 foot orange tree in a 5 gallon bucket next to the south side of the house. I keep it pruned to a more container height and we are waiting to see if it will produce. The lemons are growing, but haven’t produced yet. Can you tell us where you purchased her? I just picked the last lemon off my tree in the greenhouse. I only got 5 lemons, but surprise, surprise, surprise–I found new blossoms on a lower branch!!! I am so pleased. I haven’t fertilized at all, but I will figure out how to get some nitrogen into the soil after reading this post. It was a really timely post for me. Thanks! Ha! I love her name Lemon, I named mine Lucy and one day my daughter who lives next door said she had to move Lucy in because of a cold nip here in Alabama. My brother said to her who in the world is Lucy. Had to explain about my prize tree, who is barren right now, bless her she has 3 leaves. Hullo! Longtime reader. First time poster… We pulled our Improved Meyer Lemon in to the breakfast nook to winter (we live in Tacoma, 253 holla!). His name is Lémon and he gave us nearly a dozen perfect Meyer Lemons last year! But now he’s dropped nearly all of his leaves and I’m just in pieces over it. I was thinking of moving him back out to the deck this next week because he’s faring so poorly. He’s like the Charlie Brown Improved Meyer Lemon tree! I’m not sure if he just got too dry or if there wasn’t enough humidity or if the nook, which is an addition onto our historic home, wasn’t a controlled enough climate for him. Your thoughts, anyone? Was moving Lémon indoors to winter a grave error in botanical judgment? Can Lémon be resurrected? Same problem with my lemon tree here in Pasco, Wa. I feel your pain and sadness. I’d love to hear if your tree survives! Last fall my Meyer Lemon tree bloomed but then dropped all the flowers and leaves turned yellow and fell off. I have been good about watering weekly (in the shower to let is drain all the way) and fertilizing monthly for 3 months now, grew new leaves and she is blooming again but her leaves are starting to turn yellow again!!!! What gives?!? I am in NC and the weather has been so nice. I’m hoping I can move her outside soon.